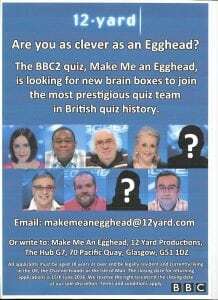 The BBC quiz show, ‘Make Me An Egghead’, hosted by Jeremy Vine, is holding a nationwide search to find two contestants (one male and one female) who are good enough to join the Eggheads, considered the UK’s most fearsome quiz team. The winner of each show will move into the next heat. The series concludes in a Grand Final and the winner will become an Egghead on the next series. We are currently looking for intelligent and competitive personalities to take part in the programme and will be holding nationwide auditions over the next few weeks. Please click on the poster below to read the criteria and contact details for applying.